We intend to find the small airparks throughout the country and film segments about those local heroes, bringing those stories to life, and put together kid workshops at those locations for the kid workshop segments. 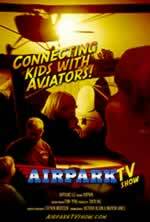 We’ll film exsiting youth aviation outreach events. We fully intend to create a TV special that is a healthy, family friendly kid show where today’s youth can meet yesterday and today’s heroes, and get involved in healthy activities that they will have with them for life. We hope that the pilot TV special will demonstrate the program’s marketability and usefulness so that it could turn into a series for broadcast and webcasting.